Millions of patients suffer from nerve pain for a variety of reasons—with people with diabetes often the worst affected. 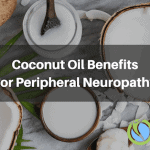 Whether you are affected by nerve pain due to an injury or as a result of diabetes-related neuropathy, you may find that the treatment options are slim in scope and ineffective. However, turmeric offers a promising alternative to help relieve nerve pain with no negative side effects. 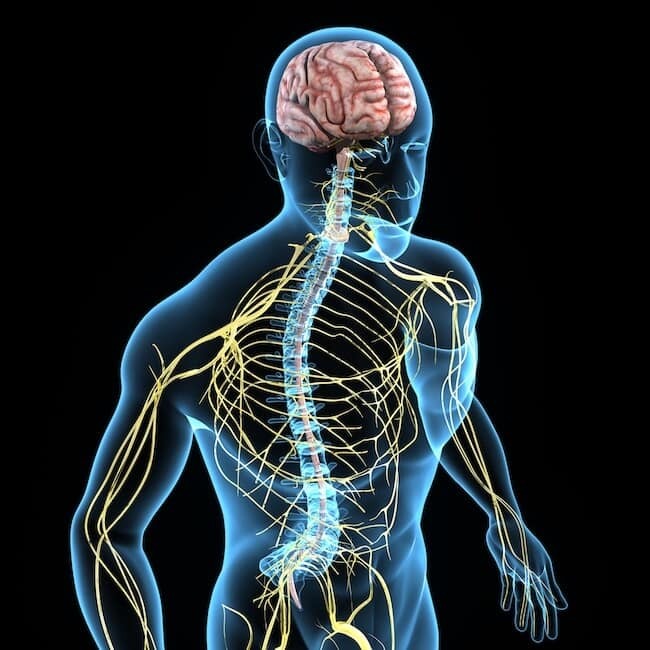 There are a lot of conditions, incidents, and medications that can lead to nerve pain. When it comes down to it, though, nerve pain is the result of damage to the nerves – whether due to an injury, a condition such as diabetes, or the use of medication. One of the most common causes of nerve pain is diabetes. Both type 1 and type 2 diabetes can lead to nerve damage, eventually causing a condition called peripheral neuropathy. 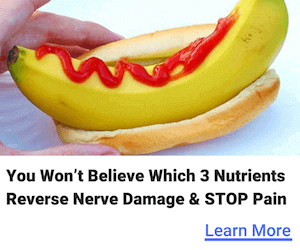 Here, nerve damage leads to several debilitating symptoms. For diabetes patients, the damage is primarily due to high blood sugar levels. Other health conditions including HIV and cancer can also lead to nerve damage. For cancer patients, this may due to a tumor pressing on a nerve, or due to the effects of cancer medication. Likewise, for HIV, both the disease itself and the drugs used to treat HIV can lead to peripheral neuropathy. Living with chronic nerve pain can be very difficult. Every person experiences nerve pain differently, with some patients finding that they are hypersensitive, while other patients experience actual pain. Some patients have other nerve-related effects, including a tingling feeling or numbness, a loss of reflexes, and mobility issues. For sufferers, nerve pain can lead to a range of problems beyond the symptoms of nerve damage itself. Constant nerve pain can lead to a lack of sleep and also contribute to what may often be pre-existing anxiety and depressive symptoms. Despite the burden suffering that nerve pain causes, treatments can be elusive, but turmeric is one of the more effective options. Turmeric a common spice. If you’ve ever eaten a bowl of yellow curry, you’ve had turmeric, as it gives this popular dish it’s distinct color. Indians have known for a long time that turmeric contains compounds that are strongly medicinal. The most important of these is curcumin. Turmeric, as used in foods, does not contain a very high concentration of curcumin, only around 3 percent. For health benefits, you will need to take a supplement which contains a concentrated amount of curcumin. However, the benefits of curcumin are widely known and range from anti-inflammatory effects through to acting as an antioxidant. Curcumin can also relieve pain, and as treatment, it has been used for years to treat nerve pain. Curcumin has proven to be a versatile treatment for a range of nerve and neurological disorders. It has been widely studied as a method of treatment for nervous system disorders of all sorts. The academic evidence shows that curcumin can help relieve nerve pain, but how does it work, and what is the evidence? We mentioned earlier in this article that people with diabetes often experience the worst neuropathic symptoms as diabetes is a condition known for the nerve damage that it causes. A 2013 study published in the International Journal of Medical Sciences studied the effect of turmeric’s active ingredient, curcumin, on an animal population. 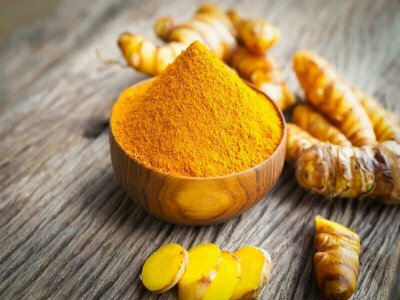 In short, the study found that curcumin reduces diabetic neuropathy by tinkering with what is called pro-inflammatory tumor necrosis factor α, TNF-α. A marker of inflammation, TNF-α can contribute to a sensation of neuropathic pain. Treatment with curcumin meant that this marker had less of an impact, which in turn, improved the symptoms of neuropathic pain. Again, focusing on the anti-inflammatory effect of curcumin, a 2016 study found that curcumin has a positive effect on spinal neuropathic pain. Though the details of the study are very technical, they are worth bearing in mind when considering whether curcumin is a treatment that should be considered by those suffering from nerve pain. The study, performed on a population of mice, again found that curcumin had pacifying effects on the chemical processes central to the transmission of pain. In particular, curcumin inhibited the NALP1 inflammasome, as well as the activation of the JAK2-STAT3 pathways. In simpler terms, curcumin can inhibit the transmission of pain, reducing the pain perceived by those suffering from nerve conditions. Turmeric's most important ingredient, curcumin, has substantial antioxidant properties. We pointed to this effect earlier in this article, and the academic evidence backs up how the antioxidant properties of curcumin can help relieve neuropathic pain. As a result, curcumin has an anti-inflammatory effect which prevents ongoing neuron inflammation while at the same time presenting an anti-bacterial effect. The study concluded that curcumin could help treat neuropathy as experienced by diabetes patients. One way to relieve nerve pain is for the nerves that are not functioning as normal to recover. When nerves heal, they are less likely to present painful symptoms. In addition to curcumin's abilities to relieve nerve pain it has also proven to useful in nerve regeneration. A 2013 study published in Neuroscience Letters outlined how curcumin has a protective effect where nerves are injured. The study investigated the rate at which nerves regenerated and found that a 100mg/kg dosage of curcumin was sufficient to promote the regeneration of damaged nerves. The authors of the study stated this underlines the therapeutic value of curcumin in the treatment of nerve disorders. Turmeric tincture. If you don’t like the taste of turmeric, then tinctures are one option. Recommended guidelines for effective pain relief involves about 10 to 30 drops taken throughout the day, about two to three times a day. Drops can be added to another drink such as a tea. Turmeric tea or milk. Another option is to drink turmeric tea or turmeric milk. Whichever you prefer, the general advice is to drink one or two cups a day to consumer enough turmeric. Turmeric supplements. Though called turmeric supplements, these supplements will often be concentrated curcumin extract at up to 95 percent. Here you should aim for 300 to 400 mg of curcumin taken two to three times a day. Everyone’s body absorbs chemicals in different ways, and you may want to experiment with different options before settling on a method that works best for you. Turmeric is not a prescription medicine. Instead, it is closer to a natural remedy. 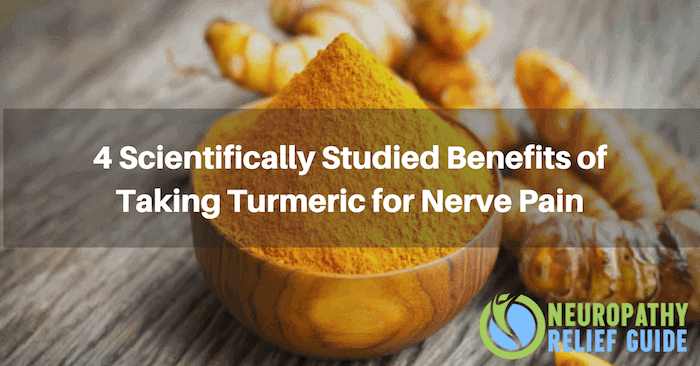 However, we have outlined very clearly the medical evidence that supports the fact the turmeric’s active compound, curcumin, can be a powerful treatment in the battle against nerve pain. It doesn’t matter whether your nerve pain is due to a bout of diabetes, or whether you are experiencing nerve pain as a side effect from a medication. Taking turmeric can help speed up the process of nerve repair which means that your nerves will express fewer painful signals in the future. At the same time, turmeric can also relieve the pain that you feel from currently damaged nerves presenting an excellent way to treat neuropathy. The benefits of turmeric have been known for some time. No matter which way you choose to consume turmeric you are likely to find that it provides a soothing effect for nerve pain including broader neuropathy. Turmeric, or more specifically curcumin, the active component in turmeric, has amassed a wealth of research which strongly supports its effectiveness for treating nervous system conditions such as neuropathy. Effective dosing should range from 300 to 400 mg a day, which can't be obtained from merely using the spice on or in foods. Supplementation will be necessary. https://www.ncbi.nlm.nih.gov/pubmed/?term=curcumin+spinal+JAK2; Curcumin ameliorates neuropathic pain by down-regulating spinal IL-1β via suppressing astroglial NALP1 inflammasome and JAK2-STAT3 signaling. Liu S1, Li Q1, Zhang MT1, Mao-Ying QL1, Hu LY1, Wu GC1, Mi WL1, Wang YQ1. https://www.ncbi.nlm.nih.gov/pubmed/30767224 ; Investigation of the utility of Curcuma caesia in the treatment of diabetic neuropathy. Grover M1, Shah K2, Khullar G3, Gupta J1, Behl T4. https://www.ncbi.nlm.nih.gov/pubmed/23669643; Curcumin promotes nerve regeneration and functional recovery in rat model of nerve crush injury. Ma J1, Liu J, Yu H, Wang Q, Chen Y, Xiang L.